UNPO: UNPO/TFD Conference Report: Prospects for Minority and Indigenous Rights in South East Asia – Towards Regional Cooperation? UNPO/TFD Conference Report: Prospects for Minority and Indigenous Rights in South East Asia – Towards Regional Cooperation? The Unrepresented Nations and Peoples Organization (UNPO) in cooperation with the Taiwan Foundation for Democracy (TFD) and the Haëlla Foundation is releasing a report titled “Prospects for Minority and Indigenous Rights in South East Asia: Towards Regional Cooperation” following a conference hosted by Urmas Paet MEP (ALDE), which was convened at the European Parliament in June 2016. The report contains the transcripts of all speeches delivered at the conference, as well as the speakers’ biographies. 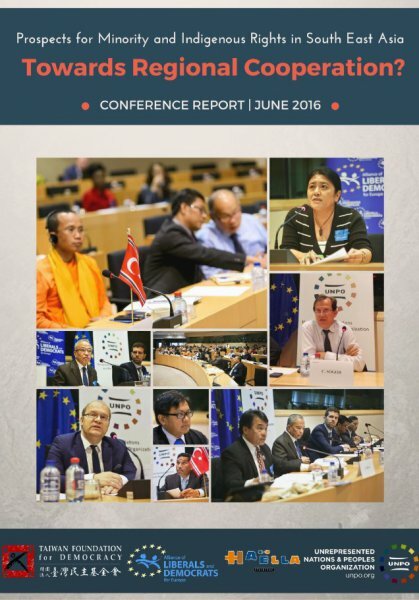 The report contains transcripts of the speeches given at the conference, namely the instructive contributions by Mr Urma Paes MEP (ALDE), Ms Johanna Green (Programme Manager at UNPO), Dr Jolan Hsieh (Taiwan Foundation for Democracy), Yapasuyongu Poiconu (Taiwan Council of Indigenous People), Michael Danielsen (Taiwan Corner), Gymbay Moua (Congress of World Hmong People), Chum Chuon Son (Khmer Kampuchea-Krom Federation), Ushatan Talukder (MP Bangladesh), Arif Fadhillah (Acheh-Sumatra National Liberation Front), Csaba Sógor MEP (EPP), Paulo Casaca (South Asia Democratic Forum), and Joan Audierne (ProtectDefenders.eu). Despite the fact that South East Asia encompasses myriads of extremely varied ethnic, cultural, religious and linguistic groups, minorities and indigenous peoples remain the region’s most vulnerable communities. Many South East Asian governments deliberately exclude these populations from decision-making processes, actively seek to minimise diversity through enforced assimilation programmes, and willingly let big business encroach the land of the region’s minority and indigenous groups. Against this background, this conference – a joint initiative by UNPO, the Taiwan Foundation for Democracy, the Haëlla Foundation and Urmas Paet MEP (ALDE) – discussed issues associated with minority and indigenous rights iin South East Asia, in particular by assessing recent developments and policies towards indigenous peoples in Taiwan and comparing the path chosen by Taipeh with other Asian cases, as well as with the state of minority rights protection mechanism in Europe. Bringing together the expertise from academics, policy-makers, human rights activists, and representatives of various ethnic, religious and linguistic groups and indigenous communities of South East Asia, the conference confirmed that there is a need to strengthen cooperation and share experiences both between different indigenous and minority groups in South East Asia, and between regional bodies such as the EU and ASEAN. To download the full report, please click here. Conference Report "Indigenous and Minority Rights in SEA"